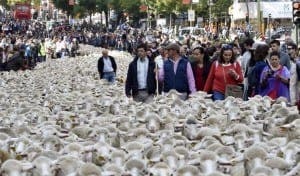 IN baaaarely believable scenes, 2,000 sheep flocked to Madrid and took over the city centre. The shepherds’ October protest in favour of droving rights brought the Spanish capital to a standstill. Sheepdogs, bells and loud bleating brought the shepherds’ woolly world to the onlooking Madrilenos. It’s the 22nd consecutive autumn they have protested in Madrid, as traditional grazing and migration rights are threatened by urban sprawl.